It's rare for me to find a moisturizer that doesn't make my hands feel slick and slippery. Too many of them claim to sink into the skin immediately but leave behind a greasy sheen -- not so great when I need to use my hands for typing all day! 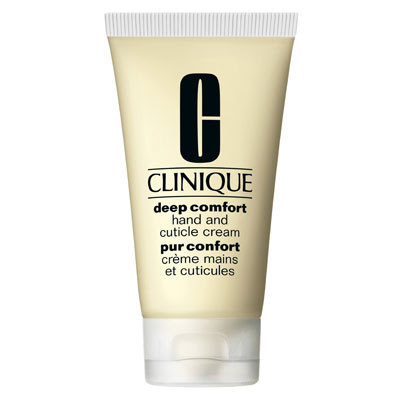 Not so with Clinique Deep Comfort Hand and Cuticle Cream. This lotion sinks into the skin relatively quickly, leaving behind nothing but super-soft and smooth skin with no hint of grimy residue. Only a dime-sized amount is enough to cover both hands and protect them against the elements -- pretty perfect as the weather in New York has been ever so strange recently. Not to mention that ingredients like Vitamins E and C and barley extract work to condition and moisturize the skin. My only complaint is that it doesn't really work for the 12 full hours it promises. I do have to reapply a couple times a day -- so I think it's a misconception to print that on the label. But all in all, I've been quite pleased with the results! Clinique Deep Comfort Hand and Cuticle Cream retails for $21 at clinique.com. Some natural ingredients, seems great!